The thalassemias are inherited disorders of hemoglobin (Hb) synthesis. Their clinical severity widely varies, ranging from asymptomatic forms to severe (see the image below) or even fatal entities. Peripheral blood film in Cooley anemia. The clinical picture of the thalassemias varies widely, depending on the severity of the condition and the age at diagnosis. In the more severe forms of the disease (eg, β-thalassemia major), symptoms vary from extremely debilitating in patients who are not receiving transfusions to mild and almost asymptomatic in those receiving regular transfusion regimens and closely monitored chelation therapy. The diagnosis of thalassemia is made through studies such as bone marrow examination, hemoglobin electrophoresis, and iron count. 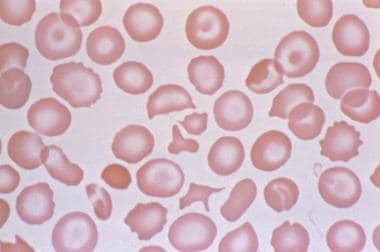 The CBC count and peripheral blood film examination results are usually sufficient to suspect the diagnosis. Hb evaluation confirms the diagnosis in β-thalassemia, Hb H disease, and Hb E/β thalassemia. Although there are many types of thalassemic syndromes, each involves decreased production of one globin chain or more, which form the different Hbs normally found in RBCs. In clinical practice, the most important types affect either α- or β-chain synthesis. Patients with thalassemia traits do not require medical or follow-up care after the initial diagnosis is made. Do not initiate iron therapy unless a definite deficiency is confirmed. Patients with severe thalassemia require medical treatment. Regular blood transfusion combined with well-monitored chelation therapy is the standard therapy. The thalassemias are inherited disorders of hemoglobin (Hb) synthesis. Their clinical severity widely varies, ranging from asymptomatic forms to severe or even fatal entities. The name Mediterranean anemia, which Whipple introduced, is misleading because the condition can be found in any part of the world. As described below, different types of thalassemia are more endemic to certain geographic regions. In 1925, Thomas Cooley, a Detroit pediatrician, described a severe type of anemia in children of Italian origin. He noted abundant nucleated red blood cells (RBCs) in the peripheral blood, which he initially thought was erythroblastic anemia, an entity that von Jaksh described earlier. Before long, Cooley realized that erythroblastemia is neither specific nor essential in this disorder and that the term erythroblastic anemia was nothing but a diagnostic catchall. Although Cooley was aware of the genetic nature of the disorder, he failed to investigate the apparently healthy parents of the affected children. In Europe, Riette described Italian children with unexplained mild hypochromic and microcytic anemia in the same year Cooley reported the severe form of anemia later named after him. In addition, Wintrobe and coworkers in the United States reported a mild anemia in both parents of a child with Cooley anemia. This anemia was similar to the one that Riette described in Italy. Only then was Cooley's severe anemia recognized as the homozygous form of the mild hypochromic and microcytic anemia that Riette and Wintrobe described. This severe form was then labeled as thalassemia major and the mild form as thalassemia minor. The word thalassemia is a Greek term derived from thalassa, which means "the sea" (referring to the Mediterranean), and emia, which means "related to blood." These initial patients are now recognized to have been afflicted with β thalassemia. In the following few years, different types of thalassemia that involved polypeptide chains other than β chains were recognized and described in detail. In recent years, the molecular biology and genetics of the thalassemia syndromes have been described in detail, revealing the wide range of mutations encountered in each type of thalassemia, depicted in the image below. Various mutations in the beta gene that result in beta thalassemia. β thalassemia alone can arise from any of more than 150 mutations. The thalassemias are inherited disorders of Hb synthesis that result from an alteration in the rate of globin chain production. A decrease in the rate of production of a certain globin chain or chains (α, β, γ, δ) impedes Hb synthesis and creates an imbalance with the other, normally produced globin chains. Because 2 types of chains (α and non-α) pair with each other at a ratio close to 1:1 to form normal Hbs, an excess of the normally produced type is present and accumulates in the cell as an unstable product, leading to the destruction of the cell. This imbalance is the hallmark of all forms of thalassemia. For this reason, most thalassemias are not considered hemoglobinopathies because the globin chains are normal in structure and because the defect is limited to a decreased rate of production of these normal chains. However, thalassemic hemoglobinopathies are recognized, as discussed below. The type of thalassemia usually carries the name of the underproduced chain or chains. The reduction varies from a slight decrease to a complete absence of production. For example, when β chains are produced at a lower rate, the thalassemia is termed β+, whereas β-0 thalassemia indicates a complete absence of production of β chains from the involved allele. The consequences of impaired production of globin chains ultimately result in the deposition of less Hb into each RBC, leading to hypochromasia. The Hb deficiency causes RBCs to be smaller, leading to the classic hypochromic and microcytic picture of thalassemia. This is true in almost all anemias caused by impairment in production of either of the 2 main components of Hb: heme or globin. However, this does not occur in the silent carrier state, since both Hb level and RBC indices remain normal. In the most common type of β thalassemia trait, the level of Hb A2 (δ2/α2) is usually elevated. This is due to the increased use of δ chains by the excessive free α chains, which results from a lack of adequate β chains with which to pair. The δ gene, unlike β and α genes, is known to have a physiologic limitation in its ability to produce adequate δ chains; by pairing with the α chains, δ chains produce Hb A2 (approximately 2.5-3% of the total Hb). Some, but not all, of the excessive α chains are used to form Hb A2 with the δ chains, whereas the remaining α chains precipitate in the cells, reacting with cell membranes, intervening with normal cell division, and acting as foreign bodies, leading to destruction of RBCs. The degree of toxicity caused by the excessive chains varies according to the type of such chains (eg, the toxicity of α chains in β thalassemia is more prominent than the toxicity of β chains in α thalassemia). In the severe forms, such as β thalassemia major or Cooley anemia, the same pathophysiology applies with substantial exaggeration. The significant excess of free α chains caused by the deficiency of β chains causes destruction of the RBC precursors in the bone marrow (ie, ineffective erythropoiesis). To understand the genetic changes that result in thalassemia, one should be familiar with the physiologic process of globin chain production in the healthy individual. The globin chain as a unit is a major building block for Hb: together with heme, it produces the Hb molecule (heme plus globin equals Hb). Two different pairs of globin chains form a tetrameric structure with a heme moiety in the center. All normal Hbs are formed from 2 α-like chains and 2 non-α chains. Various types of Hb are formed, depending on the types of chains pairing together. Such Hbs exhibit different oxygen-binding characteristics, normally related to the oxygen delivery requirement at different developmental stages in human life. In embryonic life, ζ chains (α-like chains) combine with γ chains to produce Hb Portland (ζ2/γ2) and with ε chains to produce Hb Gower-1 (ζ2/ε2). Subsequently, when α chains are produced, they form Hb Gower-2, pairing with ε chains (α2/ε2). Fetal Hb is composed of α2/γ2 and the primary adult Hb (Hb A) of α2/β2. A third physiologic Hb, known as Hb A2, is formed by α2/δ2 chains, as in the image below. Alpha chain genes in duplication on chromosome 16 pairing with non-alpha chains to produce various normal hemoglobins. All the genes that control the production of globin chains lie within 1 of 2 clusters located on 2 different chromosomes. Chromosome 11 is the site of 5 functional b-like globin genes arranged in a link cluster over 60 kilobases (kb). From left to right (5'-3'), they are ε/γ-G/γ-A/δ/β. γ-G and γ-A differ by only one amino acid (alanine vs glycine). A critical control region of the d-globin gene (promoter) is known to be defective; it inhibits messenger RNA (mRNA) processing, resulting in only a small amount of Hb A2 (α2/δ2) production, which thus accounts for less than 3% of total Hb in adult RBCs. The α-like globin gene cluster is located on chromosome 16 and consists of 3 functional genes. From left to right (5'-3'), the genes are α/α2/α1. Understanding the structure of the globin genes, how they are regulated to produce globin chains, and how the chains pair together to produce the various Hbs is critical for appreciating the different pathologic changes of this process that result in thalassemia. 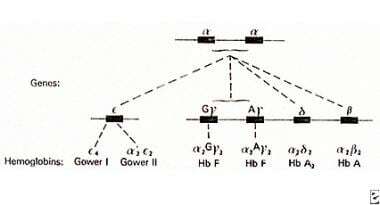 Each globin gene consists of a string of nucleotide bases divided into 3 coding sequences, termed exons, and 2 noncoding regions, known as introns or intervening sequences (IVS). See the image below. Alpha and beta globin genes (chromosomes 16 and 11, respectively). Three other regions, known as regulatory regions, are also present in the 5' noncoding or flanking region of each globin gene. The first is the promoter, which plays a major role in the transcription of the structural genes. The second region is the enhancer, which has an important role in promoting erythroid-specific gene expression, as well as in coordinating the changes in globin gene activity at different stages of development (embryonal, fetal, adult). Enhancers can influence gene expression, despite being located some distance away from the gene itself, and, unlike the promoter, they can stimulate transcription irrespective of their orientation relative to the transcription start site. Finally, master regulatory sequences, known as locus control regions (in the β-globin gene family) and HS40 (in the α gene complex), are responsible for activating the genes in erythroid cells. Each of these regulatory sequences has a modular structure that consists of short nucleotide motifs that act as binding sites for transcriptional activator or suppressor molecules. Such molecules activate or suppress gene expression in different cell types at different stages of development. A certain gene is transcribed by an initiation complex formed of certain proteins and a number of transcription factors, which interact with binding sites on the promoters and other regulatory sequences of the relevant genes. When a gene is transcribed, mRNA is synthesized from one of the gene's DNA strands by the action of RNA polymerase. The initial product is a large mRNA precursor. 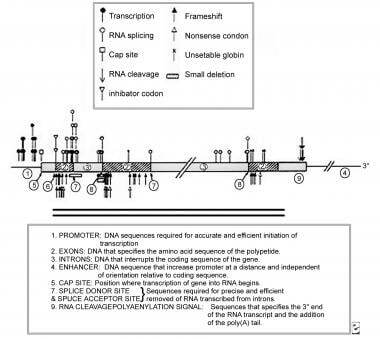 Both exons and introns are initially present on this mRNA precursor; the introns are ultimately subsequently eliminated, and the exons are spliced together in the nucleus. At this stage, the mRNA, which has also been modified at both 5' and 3' ends, moves to the cytoplasm to act as a template for the production of globin chains. Carrier molecules (transfer RNA [tRNA]) transport amino acids to the mRNA template. Each amino acid has a specific tRNA, which also contains 3 bases (anticodon), complimentary to the mRNA codons for that amino acid. The position of each amino acid in the globin chain is thus established by its corresponding triplet code (codon) in the globin gene. The cytidine, uridine, and guanosine (CUG) codon, for example, encodes the amino acid leucine, while the adenosine, adenosine, and adenosine (AAA) codon encodes lysine. When a tRNA molecule carries the initial amino acid to the template, directed by codon-anticodon base pairing, globin chain synthesis begins. Once the first tRNA is in place, a complex is formed between several protein initiation factors and the subunit of the ribosome that is to hold the growing peptide chains together on the mRNA as it is translated. A second tRNA moves in alongside, and a new amino acid is bound to the first with a peptide bond, resulting in a peptide chain 2 amino acids long. This process continues from left to right until a specific codon for termination is reached. At this point, the completed peptide chain drops off the ribosome-mRNA complex and the ribosomal subunits are recycled. The globin chain is now ready to join a heme molecule and 3 other globin chains to form an Hb molecule. The developmental switches from embryonic to fetal and then to adult Hb production are synchronized throughout the different organs of hematopoiesis (yolk sack, liver, bone marrow), which function at various stages of development. Even though the mechanism of such switches is not clearly understood, the globin gene promoter is known to contain information that specifies developmental stages of transcription. To date, more than 1000 inherited mutations that affect either the structure or synthesis of the α- and β-globin chains are known. Mutations that result in β or α thalassemia are similar in principle but different in their patterns. Presently, more than 200 molecular defects known to downregulate the expression of β globin have been characterized. Such defects result in various types of β thalassemia. Major deletions in β thalassemia are unusual (in contrast to α thalassemia), and most of the encountered mutations are single base changes, small deletions, or insertions of 1-2 bases at a critical site along the gene, as in the image below. 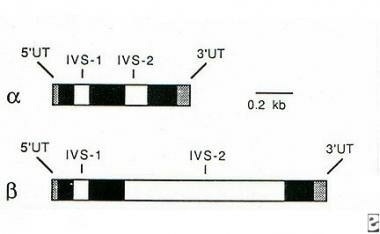 These mutations occur in both exons and introns. For example, in a nonsense mutation, a single base change in the exon generates a stop codon in the coding region of the mRNA, resulting in premature termination of globin chain synthesis. This termination leads to the production of short, nonviable β chains. Conversely, in the frame shift mutation, one or more bases on the exon are lost or inserted, resulting in a change in the reading frame of the genetic code or the production of a new stop codon. RNA-splicing mutations are fairly common and represent a large portion of all mutations that result in β thalassemia. These mutations corrupt the splicing process. The importance of precise splicing in the quantitative production of stable functional mRNA cannot be overemphasized. Slippage by even one nucleotide changes the reading frame of the mRNA. Both ends of the RNA introns (at the junction with the exons) have specific consensus sequences; these motifs include GT in the 5' (left end or donor site) consensus sequence and AG in the 3' (right end or acceptor site) consensus sequence. Such sequences are obligatory for correct splicing, and a single substitution at the invariant GT or AG sequence prevents splicing altogether and results in β-0 or α-0 thalassemia. Mutations in the other members of the consensus sequences, although still highly conserved, result in variable degrees of ineffective β-globin production, causing milder types of β thalassemia. Mutations in exon sequences may activate a cryptic splice site. For example, in exon 1 of the β-globin gene, a consensus sequence that resembles a sequence in IVS-1 has been identified as the site for several distinct mutations, resulting in a gene that carries the features of both thalassemia and hemoglobinopathy simultaneously (quantitatively and qualitatively abnormal Hb production). This type of mutation represents a clear link between the thalassemias and the hemoglobinopathies, and, accordingly, these are labeled thalassemic hemoglobinopathies. Thus, mutations at codon 19 (A to G), 26 (G to A), and 27 (G to T)—all in exon 1—result in reduced production of mRNA (thalassemia) because of inefficient splicing and an amino acid substitution encoded by the mRNA that is spliced and translated (albeit inefficiently) into protein. The resulting abnormal Hbs are Malay, E, and Knossos, respectively. The flanking regions of the β-globin gene are also sites for various mutations. A single base substitution that involves the promoter element, for example, can downregulate β-globin gene transcription, resulting in a mild form of β thalassemia. Conversely, a mutation that affects the 3' end of the β-globin mRNA can interfere with its processing, resulting in a severe form of β thalassemia. Clearly, many different β thalassemia mutations exist, and compound heterozygosity is frequently encountered. The resulting laboratory findings may lead to confusion. An example is the patient who manifests symptoms of β thalassemia major without an elevated Hb A2 level. The explanation for such a situation is often co-inheritance of β and δ thalassemia. δ/β thalassemia further is divided into δ/β+ or δ/β-0. In the first type, a misalignment in the δ/β genes during meiosis results in the production of fused δ/β genes, a process responsible for the production of an Hb variant termed Hb Lepore. The fused δ/β gene is under the control of a δ-globin gene promoter region (the β gene promoter is deleted in the process). Because the δ gene promoter carries mutations that lead to ineffective transcription, the fused δ/β chains are produced in limited amounts, resulting in thalassemia. This is in addition to the hemoglobinopathy. Conversely, in d/β-0 thalassemia, a large deletion occurs in the β-globin gene cluster, removing both the δ and the β genes, which can also extend to involve all globin genes on chromosome 11, thus producing ε, γ, δ, and β-0 thalassemia. The basic defect in all types of thalassemia is imbalanced globin chain synthesis. However, the consequences of accumulation of the excessive globin chains in the various types of thalassemia are different. In β thalassemia, excessive α chains, unable to form Hb tetramers, precipitate in the RBC precursors and, in one way or another, produce most of the manifestations encountered in all of the β thalassemia syndromes; this is not the situation in α thalassemia. The excessive chains in α thalassemia are γ chains earlier in life and β chains later in life. Because such chains are relatively soluble, they are able to form homotetramers that, although relatively unstable, nevertheless remain viable and able to produce soluble Hb molecules such as Hb Bart (4 γ chains) and Hb H (4 β chains). These basic differences in the 2 main types of thalassemia are responsible for the major differences in their clinical manifestations and severity. α chains that accumulate in the RBC precursors are insoluble, precipitate in the cell, interact with the membrane (causing significant damage), and interfere with cell division. This leads to excessive intramedullary destruction of the RBC precursors. In addition, the surviving cells that arrive in the peripheral blood with intracellular inclusion bodies (excess chains) are subject to hemolysis; this means that both hemolysis and ineffective erythropoiesis cause anemia in the person with β thalassemia. The ability of some RBCs to maintain the production of γ chains, which are capable of pairing with some of the excessive α chains to produce Hb F, is advantageous. Binding some of the excess a chains undoubtedly reduces the symptoms of the disease and provides additional Hb with oxygen-carrying ability. Furthermore, increased production of Hb F, in response to severe anemia, adds another mechanism to protect the RBCs in persons with β thalassemia. The elevated Hb F level increases oxygen affinity, leading to hypoxia, which, together with the profound anemia, stimulates the production of erythropoietin. As a result, severe expansion of the ineffective erythroid mass leads to severe bone expansion and deformities. Both iron absorption and metabolic rate increase, adding more symptoms to the clinical and laboratory manifestations of the disease. The large numbers of abnormal RBCs processed by the spleen, together with its hematopoietic response to the anemia if untreated, results in massive splenomegaly, leading to manifestations of hypersplenism. If the chronic anemia in these patients is corrected with regular blood transfusions, the severe expansion of the ineffective marrow is reversed. Adding a second source of iron would theoretically result in more harm to the patient. However, this is not the case because iron absorption is regulated by 2 major factors: ineffective erythropoiesis and iron status in the patient. Ineffective erythropoiesis results in increased absorption of iron because of downregulation of the HAMP gene, which produces a liver hormone called hepcidin. Hepcidin regulates dietary iron absorption, plasma iron concentration, and tissue iron distribution and is the major regulator of iron. It acts by causing degradation of its receptor, the cellular iron exporter ferroportin. When ferroportin is degraded, it decreases iron flow into the plasma from the gut, from macrophages, and from hepatocytes, leading to a low plasma iron concentration. In severe hepcidin deficiency, iron absorption is increased and macrophages are usually iron depleted, such as is observed in patients with thalassemia intermedia. By administering blood transfusions, the ineffective erythropoiesis is reversed, and the hepcidin level is increased; thus, iron absorption is decreased and macrophages retain iron. Iron status is another important factor that influences iron absorption. In patients with iron overload (eg, hemochromatosis), the iron absorption decreases because of an increased hepcidin level. However, this is not the case in patients with severe β thalassemia because a putative plasma factor overrides such mechanisms and prevents the production of hepcidin. Thus, iron absorption continues despite the iron overload status. As mentioned above, the effect of hepcidin on iron recycling is carried through its receptor "ferroportin," which exports iron from enterocytes and macrophages to the plasma and exports iron from the placenta to the fetus. Ferroportin is upregulated by iron stores and downregulated by hepcidin. This relationship may also explain why patients with β thalassemia who have similar iron loads have different ferritin levels based on whether or not they receive regular blood transfusions. For example, patients with β thalassemia intermedia who are not receiving blood transfusions have lower ferritin levels than those with β thalassemia major who are receiving regular transfusion regimens, despite a similar iron overload. In the latter group, hepcidin allows recycling of the iron from the macrophages, releasing high amounts of ferritin. In patients with β thalassemia intermedia, in whom the macrophages are depleted despite iron overload, lower amounts of ferritin are released, resulting in a lower ferritin level. Most nonheme iron in healthy individuals is bound tightly to its carrier protein, transferrin. In iron overload conditions, such as severe thalassemia, the transferrin becomes saturated, and free iron is found in the plasma. This iron is harmful since it provides the material for the production of hydroxyl radicals and additionally accumulates in various organs, such as the heart, endocrine glands, and liver, resulting in significant damage to these organs. By understanding the etiology of the symptoms in thalassemia, one can appreciate that certain modifiers may result in the development of milder types of thalassemia. Factors that may reduce the degree of globin chain imbalance are expected to modify the severity of the symptoms; co-inheritance of α thalassemia, the presence of higher Hb F level, or the presence of a milder thalassemia mutation all typically ameliorate the symptoms of thalassemia. In 1949, Haldane suggested a selective advantage for survival in individuals with the thalassemia trait in regions where malaria is endemic. He argued that lethal RBC disorders such as thalassemia, sickle cell disease, and G-6-PD deficiency are present almost exclusively in tropical and subtropical regions of the world. The incidence of these genetic mutations in a certain population thus reflects the balance between the premature death of homozygotes and the increased fitness of heterozygotes. For instance, in β thalassemia, the frequency of the gene is greater than 1% in the Mediterranean Basin, India, Southeast Asia, North Africa, and Indonesia; it is very uncommon in other parts of the world. α thalassemia may be the most common single gene disorder in the world (5-10% in the Mediterranean, 20-30% in West Africa, approximately 68% in the South Pacific); however, the gene prevalence in Northern Europe and Japan is less than 1%. The mechanism of protection against malaria is not clear. Hb F in cells has been demonstrated to retard the growth of the malaria parasite, and, by virtue of its high level in infants with β thalassemia trait, the fatal cerebral malaria known to kill infants in these areas may be prevented. The RBCs of patients with Hb H disease have also shown a suppressive effect on the growth of the parasites. This effect is not observed in α thalassemia trait. A large number of thalassemic syndromes are currently known; each involves decreased production of one globin chain or more, which form the different Hbs normally found in RBCs. The most important types in clinical practice are those that affect either α or β chain synthesis. This is a fairly common type of subclinical thalassemia, usually found by chance among various ethnic populations, particularly African American, while the child is being evaluated for some other condition. As pointed out above, 2 α genes are located on each chromosome 16, giving α thalassemia the unique feature of gene duplication, see the image below. This duplication is in contrast to only one β-globin gene on chromosome 11. In the silent carrier state, one of the α genes is usually absent, leaving only 3 of 4 genes (aa/ao). Patients are hematologically healthy, except for occasional low RBC indices. In this form, the diagnosis cannot be confirmed based on Hb electrophoresis results, which are usually normal in all α thalassemia traits. More sophisticated tests are necessary to confirm the diagnosis. One may look for hematologic abnormalities in family members (eg, parents) to support the diagnosis. A CBC count in one parent that demonstrates hypochromia and microcytosis in the absence of any explanation is frequently adequate evidence for the presence of thalassemia. α thalassemia trait: This trait is characterized by mild anemia and low RBC indices. This condition is typically caused by the deletion of 2 α (a) genes on one chromosome 16 (aa/oo) or one from each chromosome (ao/ao). This condition is encountered mainly in Southeast Asia, the Indian subcontinent, and some parts of the Middle East. The ao/ao form is much more common in black populations because the doubly deleted (oo) form of chromosome 16 is rare in this ethnic group. Hb H disease: This condition, which results from the deletion or inactivation of 3 α globin genes (oo/ao), represents α thalassemia intermedia, with mildly to moderately severe anemia, splenomegaly, icterus, and abnormal RBC indices. When peripheral blood films stained with supravital stain or reticulocyte preparations are examined, unique inclusions in the RBCs are usually observed. These inclusions represent b chain tetramers (Hb H), which are unstable and precipitate in the RBC, giving it the appearance of a golf ball. These inclusions are termed Heinz bodies, depicted below. Supra vital stain in hemoglobin H disease that reveals Heinz bodies (golf ball appearance). α thalassemia major: This condition is the result of complete deletion of the a gene cluster on both copies of chromosome 16 (oo/oo), leading to the severe form of homozygous α thalassemia, which is usually incompatible with life and results in hydrops fetalis unless intrauterine blood transfusion is given. Silent carrier β thalassemia: Similar to patients who silently carry α thalassemia, these patients have no symptoms, except for possible low RBC indices. The mutation that causes the thalassemia is very mild and represents a β+ thalassemia. β thalassemia trait: Patients have mild anemia, abnormal RBC indices, and abnormal Hb electrophoresis results with elevated levels of Hb A2, Hb F, or both. 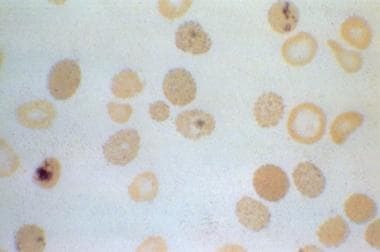 Peripheral blood film examination usually reveals marked hypochromia and microcytosis (without the anisocytosis usually encountered in iron deficiency anemia), target cells, and faint basophilic stippling, as depicted below. The production of β chains from the abnormal allele varies from complete absence to variable degrees of deficiency. 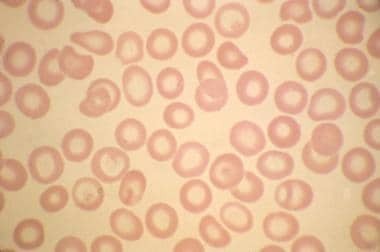 Peripheral blood film in thalassemia minor. Thalassemia intermedia: This condition is usually due to a compound heterozygous state, resulting in anemia of intermediate severity, which typically does not require regular blood transfusions. β thalassemia associated with β chain structural variants: The most significant condition in this group of thalassemic syndromes is the Hb E/β thalassemia, which may vary in its clinical severity from as mild as thalassemia intermedia to as severe as β thalassemia major. Thalassemia major (Cooley anemia): This condition is characterized by transfusion-dependent anemia, massive splenomegaly, bone deformities, growth retardation, and peculiar facies in untreated individuals, 80% of whom die within the first 5 years of life from complications of anemia. 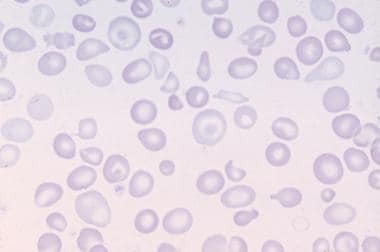 Examination of a peripheral blood preparation in such patients reveals severe hypochromia and microcytosis, marked anisocytosis, fragmented RBCs, hypochromic macrocytes, polychromasia, nucleated RBCs, and, on occasion, immature leukocytes, as shown below. Because of immigration to the United States from all parts of the world and the intermarriages that have taken place over the years, all types of thalassemia occur in any given part of the country. However, until recently, the number of patients with severe forms of both β and α thalassemia has been very limited. For this reason, finding more than 2-5 patients with the very severe forms in any pediatric hematology center is unusual (except for in the few referral centers in the United States). However, this situation is changing rapidly in certain parts of the country. In the last 10 years, Asian immigration has been steadily increasing. According to the Federal Census Bureau, in 1990, 6.9 million Asians were in the United States, twice that reported in the 1980 Census count. The prevalence of various thalassemia syndromes in this population is very high. β and α thalassemia, as well as Hb E/β thalassemia, are currently on the rise in the state of California as a result of the large concentration of Asian immigrants in that part of the country. The interaction between Hb E (a β chain variant) and β thalassemia (both very common among Southeast Asians) has created the Hb E/β thalassemia entity, which is now believed to be the most common thalassemia disorder in many regions of the world, including coastal North America, thus replacing β thalassemia major in frequency. For this reason, the cord-blood screening program for detection of hemoglobinopathy in California has been modified to include the detection of Hb H disease. In California alone, 10-14 new cases of β thalassemia major and Hb E/β thalassemia and 40 cases of neonatal Hb H disease are detected annually. Worldwide, 15 million people have clinically apparent thalassemic disorders. Reportedly, disorders worldwide, and people who carry thalassemia in India alone number approximately 30 million. These facts confirm that thalassemias are among the most common genetic disorders in humans; they are encountered among all ethnic groups and in almost every country around the world. Certain types of thalassemia are more common in specific parts of the world. β thalassemia is much more common in Mediterranean countries such as Greece, Italy, and Spain. Many Mediterranean islands, including Cyprus, Sardinia, and Malta, have a significantly high incidence of severe β thalassemia, constituting a major public health problem. For instance, in Cyprus, 1 in 7 individuals carries the gene, which translates into 1 in 49 marriages between carriers and 1 in 158 newborns expected to have β thalassemia major. As a result, preventive measures established and enforced by public health authorities have been very effective in decreasing the incidence among their populations. β thalassemia is also common in North Africa, the Middle East, India, and Eastern Europe. Conversely, α thalassemia is more common in Southeast Asia, India, the Middle East, and Africa. α thalassemia major is a mortal disease, and virtually all affected fetuses are born with hydrops fetalis as a result of severe anemia. Several reports describe newborns with α thalassemia major who survived after receiving intrauterine blood transfusions. Such patients require extensive medical care thereafter, including regular blood transfusions and chelation therapy, similar to patients with β thalassemia major. Morbidity and mortality remain high among such patients. In the rare reports of newborns with α thalassemia major born without hydrops fetalis who survived without intrauterine transfusion, high level of Hb Portland, which is a normally functioning embryonic Hb, is thought to be the cause for the unusual clinical course. Patients with Hb H disease also require close monitoring. They may require frequent or only occasional blood transfusions, depending on the severity of the condition. Some patients may require splenectomy. Morbidity is usually related to the anemia, complications of blood transfusions, massive splenomegaly in some patients, or the complications of splenectomy in others. Morbidity and mortality are not limited to untreated persons; those receiving well-designed treatment regimens also may be susceptible to the various complications of the disease. Organ damage due to iron overload, chronic serious infections precipitated by blood transfusions, or complications of chelation therapy, such as cataracts, deafness, or infections with unusual microorganisms (eg, Yersinia enterocolitica), are all considered potential complications. Although thalassemia occurs in all races and ethnic groups, certain types of thalassemia are more common in some ethnic groups than in others (see Frequency). β thalassemia is common in southern Europe, the Middle East, India, and Africa. α thalassemia is more common in Southeast Asia; nevertheless, it is also seen in other parts of the world. Furthermore, specific mutations of the same type of thalassemia are more common among certain ethnic groups than others; this facilitates the screening and diagnostic processes because certain probes for the more common mutations in a particular region are usually readily available. The α thalassemia trait in Africa is usually not of the cis deletion on chromosome 16, unlike the condition in Southeast Asia, which is associated with complete absence of the α gene on one chromosome. When both parents have the cis deletion, the fetus may develop hydrops fetalis. For this reason, hydrops fetalis is not a risk in the African population, although it remains a risk for Southeast Asian population. Both sexes are equally affected with thalassemia. Despite thalassemia's inherited nature, age at onset of symptoms varies significantly. In α thalassemia, clinical abnormalities in patients with severe cases and hematologic findings in carriers are evident at birth. Unexplained hypochromia and microcytosis in a neonate, depicted below, are highly suggestive of the diagnosis. Peripheral blood film in hemoglobin H disease in a newborn. However, in the severe forms of β thalassemia, symptoms may not be evident until the second half of the first year of life; until that time, the production of γ-globin chains and their incorporation into fetal Hb can mask the condition. Milder forms of thalassemia are frequently discovered by chance and at various ages. Many patients with an apparent homozygous β thalassemia condition (ie, hypochromasia, microcytosis, electrophoresis negative for Hb A, evidence that both parents are affected) may show no significant symptoms or anemia for several years. Almost all such patients' conditions are categorized as β thalassemia intermedia during the course of their disease. This situation usually results when the patient has a milder form of the mutation, is a compound heterozygote for β+ and β-0 thalassemia, or has other compound heterozygosity. Lucarelli G, Galimberti M, Polchi P, et al. Marrow transplantation in patients with thalassemia responsive to iron chelation therapy. N Engl J Med. 1993 Sep 16. 329(12):840-4. [Medline]. Hoffbrand AV, Taher A, Cappellini MD. How I treat transfusional iron overload. Blood. 2012 Nov 1. 120(18):3657-69. [Medline]. Brooks M. FDA oks deferasirox for nontransfusion-dependent thalassemia. Medscape Medical News. Jan 23, 2013. [Full Text]. Reuters staff. FDA approves Exjade in patients with genetic blood disorder. Reuters. Available at http://www.reuters.com/article/novartis-exjade-idUSL1N0ASEXC20130123. Jan 23, 2013; Accessed: Aug 23, 2017. Joly P, Lacan P, Garcia C, Couprie N, Francina A. Identification and molecular characterization of four new large deletions in the beta-globin gene cluster. Blood Cells Mol Dis. 2009 Mar 6. [Medline]. Nemeth E. Targeting the hepcidine-ferroportin axis in the diagnosis and treatment of anemias. Adv Hematol. 2010. [Medline]. [Full Text]. Lai K, Huang G, Su L, He Y. The prevalence of thalassemia in mainland China: evidence from epidemiological surveys. Sci Rep. 2017 Apr 19. 7 (1):920. [Medline]. [Full Text]. Rivella S. β-thalassemias: paradigmatic diseases for scientific discoveries and development of innovative therapies. Haematologica. 2015 Apr. 100 (4):418-30. [Medline]. Finotti A, Breda L, Lederer CW, et al. Recent trends in the gene therapy of β-thalassemia. J Blood Med. 2015. 6:69-85. [Medline]. Tantawy AA, Adly AA, Ismail EA, Youssef OI, Ali ME. Growth differentiation factor-15 in children and adolescents with thalassemia intermedia: Relation to subclinical atherosclerosis and pulmonary vasculopathy. Blood Cells Mol Dis. 2015 Aug. 55 (2):144-50. [Medline]. Inati A, Noureldine MA, Mansour A, Abbas HA. Endocrine and bone complications in β-thalassemia intermedia: current understanding and treatment. Biomed Res Int. 2015. 2015:813098. [Medline]. [Full Text]. Musallam KM, Taher AT. Mechanism of renal disease in B-thalassemia. J Am Soc Nephrol. Aug; 2012. 23 (8):1299-302. [Medline]. Engkakul P, Mahashoklertwattana P, Jaovisidha S, Chuansumrit A, Poomthavorn P, et al. Unrecognized vertebral fractures in adolescents and young adults with thalassemia syndromes. J pediatr Hematol Oncol. Apr; 2013. 35 (3):212-7. [Medline]. Deborah Chirnomas S, Geukes-Foppen M, Barry K, et al. Practical implications of liver and heart iron load assessment by T2*-MRI in children and adults with transfusion-dependent anemias. Am J Hematol. 2008 Oct. 83(10):781-3. [Medline]. Maggio A, Vitrano A, Calvaruso G , Barone R, Rigano, P, et al. Serial echocardiographic left ventricular ejection fraction measurements: A tool for detecting thalassemia major patients at risk of cardiac death. Blood cells Mol Dis. Apr; 2013. 50 (4):241-6. [Medline]. Hankins JS, McCarville MB, Loeffler RB, et al. R2* magnetic resonance imaging of the liver in patients with iron overload. Blood. 2009 Mar 4. [Medline]. [Full Text]. Ricchi P, Ammirabile M, Costantini S, Di Matola T, Spasiano A, et al. Splenectomy is a risk factor for developing hyperuricemia and nephrolithiasis in patients with thalassemia intermedia:a retrospective study. Blood cells Mol Dis. Oct/ 2012. 49(3-4):133-5. [Medline]. Saewong T, Ounjaijean S, Mundee Y, et al. Effects of Green Tea on Iron Accumulation and Oxidative Stress in Livers of Iron-Challenged Thalassemic Mice. Med Chem. 2010 Mar 11. [Medline]. Koren A, Levin C, Dgany O, et al. Response to hydroxyurea therapy in beta-thalassemia. Am J Hematol. 2008 May. 83(5):366-70. [Medline]. Karimi M, Borzouee M, Mehrabani A, Cohan N. Echocardiographic finding in beta-thalassemia intermedia and major: absence of pulmonary hypertension following hydroxyurea treatment in beta-thalassemia intermedia. Eur J Haematol. 2009 Mar. 82(3):213-8. [Medline]. Geffner ME, Karlsson H. Use of recombinant human growth hormone in children with thalassemia. Horm Res. 2009 Jan. 71 Suppl 1:46-50. [Medline]. [Guideline] Langlois S, Ford JC, Chitayat D, et al. Carrier screening for thalassemia and hemoglobinopathies in Canada. J Obstet Gynaecol Can. 2008 Oct. 30(10):950-71. [Medline]. Timbs AT, Rugless MJ, Gallienne AE, Haywood AM, Henderson SJ, et al. Prenatal diagnosis of hemoglobinopathies by pyrosequencing :a more sensitive and rapid approach to fetal genotyping. hemoglobin. Jan;2012. 36 (2):144-50. [Medline]. Papasavva T, Van ljcken WF, Kockx CE, Van den Hout MC, Kountouris P, et al. Next generation sequencing of SNPs for non-invasive prenatal diagnosis:challenges and feasibility as illustrated by an application to B-thalassemia. Eur J Hum Genet. Apr; 2013. E Pub ahead of print:[Medline]. Cowan RS. Moving up the slippery slope: mandated genetic screening on Cyprus. Am J Med Genet C Semin Med Genet. 2009 Feb 15. 151C(1):95-103. [Medline]. Srivorakun H, Fucharoen G, Sae-Ung N, Sanchaisuriya K, Ratanasiri T, Fucharoen S. Analysis of fetal blood using capillary electrophoresis system: a simple method for prenatal diagnosis of severe thalassemia diseases. Eur J Haematol. 2009 Feb 17. [Medline]. Winichagoon P, Svasti S, Munkongdee T, et al. Rapid diagnosis of thalassemias and other hemoglobinopathies by capillary electrophoresis system. Transl Res. 2008 Oct. 152(4):178-184. [Medline]. Yi P, Chen Z, Yu L, et al. Development of a PCR/LDR/capillary electrophoresis assay with potential for the detection of a beta-thalassemia fetal mutation in maternal plasma. J Matern Fetal Neonatal Med. 2010 Feb 1. [Medline]. Kwiatkowski JL, Kim HY, Thompson AA, Quinn CT, Mueller BU, et al. Chelation use and iron burden in North American and British thalassemia patients:A report from the thalassemia longitudinal cohort. Blood. Mar;2012. 119 (12):2746-53. [Medline]. Vichinsky E, El-Beshlawy A, Al Zoebie A, et al. Long-term safety and efficacy of deferasirox in young pediatric patients with transfusional hemosiderosis: Results from a 5-year observational study (ENTRUST). Pediatr Blood Cancer. 2017 Sep. 64 (9):[Medline]. Barnett CF, Hsue PY, Machado RF. Pulmonary hypertension: an increasingly recognized complication of hereditary hemolytic anemias and HIV infection. JAMA. 2008 Jan 23. 299(3):324-31. [Medline]. Morris CR, Gladwin MT, Kato GJ. Nitric oxide and arginine dysregulation: a novel pathway to pulmonary hypertension in hemolytic disorders. Curr Mol Med. 2008 Nov. 8(7):620-32. [Medline]. El-Beshlawy A, Youssry I, El-Saidi S, et al. Pulmonary hypertension in beta-thalassemia major and the role of L-carnitine therapy. Pediatr Hematol Oncol. 2008 Dec. 25(8):734-43. [Medline]. Metarugcheep P, Chanyawattiwongs S, Srisubat K, Pootrakul P. Clinical silent cerebral infarct (SCI) in patients with thalassemia diseases assessed by magnetic resonance imaging (MRI). J Med Assoc Thai. 2008 Jun. 91(6):889-94. [Medline]. Parker TM, Ward LM, Johnston DL, Ventureya E, Klaassen RJ. A case of Moyamoya syndrome and hemoglobin E/beta-thalassemia. Pediatr Blood Cancer. 2009 Mar. 52(3):422-4. [Medline]. Goldschmidt N, Spectre G, Brill A, et al. Increased platelet adhesion under flow conditions is induced by both thalassemic platelets and red blood cells. Thromb Haemost. 2008 Nov. 100(5):864-70. [Medline]. Singer ST, Ataga KI. Hypercoagulability in sickle cell disease and beta-thalassemia. Curr Mol Med. 2008 Nov. 8(7):639-45. [Medline]. Fung EB, Harmatz PR, Lee PD, et al. Increased prevalence of iron-overload associated endocrinopathy in thalassaemia versus sickle-cell disease. Br J Haematol. 2006 Nov. 135(4):574-82. [Medline]. Voskaridou E, Christoulas D, Plata E, Bratengeier C, Anastasilakis A, et al. High circulating sclerostine is present in patients with thalassemia-associated osteoporosis and correlates with bone mineral density. Horm Metab Res. Nov;2012. 44 (12):909-13. [Medline]. Singer ST, Vichinsky EP, Gildengorin G, van Disseldorp J, Rosen M, Cedars MI. Reproductive capacity in iron overloaded women with thalassemia major. Blood. 2011 Sep 8. 118(10):2878-81. [Medline]. [Full Text]. Delvecchio M, Cavallo L. Growth and endocrine function in thalassemia major in childhood and adolescence. J Endocrinol Invest. 2010 Jan. 33(1):61-8. [Medline]. Poggi M, Pascucci C, Monti S, et al. Prevalence of Growth hormone (GH) Deficiency in Adult polytransfused betaThalassaemia patients (TM) and correlation with Transfusional and Chelation Parameters. J Endocrinol Invest. 2010 Feb 15. [Medline]. De Sanctis V, Borsari G, Brachi S, Govoni M, Carandina G. Spermatogenesis in young adult patients with beta-thalassaemia major long-term treated with desferrioxamine. Georgian Med News. 2008 Mar. 74-7. [Medline]. Karabulut A, Balci Y, Demirlenk S, Semiz S. Gonadal dysfunction and pelvic sonographic findings in females with thalassaemia major. Gynecol Endocrinol. 2010 Apr. 26(4):307-10. [Medline]. Hladun R, Elorza I, Olive T, et al. [Results of hematopoietic stem cell transplantation in hemoglobinopathies: thalassemia major and sickle cell disease]. An Pediatr (Barc). 2013 Aug. 79 (2):75-82. [Medline]. Switzer WM, Shankar A, Trimble SR, et al. Human T cell lymphotropic virus type 1 infection among U.S. thalassemia patients. AIDS Res Hum Retroviruses. 2013 Jul. 29 (7):1006-9. [Medline]. Peripheral blood in iron deficiency anemia. The classic "hair on end" appearance on plain skull radiographs of a patient with Cooley anemia. Excessive iron in a bone marrow preparation.